Recently we made a nifty calculator that looked at the cost of renting or buying over the course of 10 years. What we have started to see in the brokerage this year is an increase in applications (generally), but specifically in places where people are looking at purchase costs versus the cost of renting. Here is a property in Marino in Dublin 3, it is costing €165,000. It is a doer-upper so we’ll do figures based on €200,000. A house in this area will rent for €1,150 a month. Using the rent or buy calculator we see that you would be better off to the tune of €45,000 over 10 years (not factoring in changes in rents or rates). Another way to look at it is this – your cost after Tax Relief at Source would be c. €700 per month for this property. Compare that to the €1,150 renting price. Even without TRS the monthly cost of €850 is cheaper than renting, even if you factor in the household charge, insurance and minor maintenance. It is important to note that the interest rate applied in that calculator is 5% which factors in some rate increases that have not happened. Rents on the other hand are (oddly) not going down according to the latest CSO figures (see page 3). Some stability in rental prices has been reported for several months now. Of course, that could change, but the recent property barometer showed something interesting, in Dublin 3 bed semi’s went up in price by 1.6%. This ties in with something we have been saying for a long time now, that any recovery will be ‘pockmarked & stratified‘ – certain neighbourhoods (primarily cities) at certain price levels. In terms of the type of stock, non-apartment 2nd hand houses is what seems to be the safest bet. Another example on the West side of the city would be Pinebrook in Clonsilla, this property is listing at €194,950. It is listed for rent at €950. Using the calculator again you see that the cost over 10 years is lower (the capital owing part reflects movements in prices and repayments). Using a mortgage calculation it is €837 before TRS of €146 which would give a net cost of €691. This exercise is being repeated across the city. In some places it makes no sense at all to buy (typically the upper end of the market), sometimes that reflects a premium in certain neighbourhoods. Consider Foxrock in South Dublin, posh neighbourhood, you can rent there for €1,600 a month, but to buy there will cost about €400,000. Comparing only the cost of buying (€231k over 10yrs) versus the cost of renting (€190,000 over 10yrs) you see that it would be nonsensical to purchase a home there. Unless you really want to pay the premium to OWN a property there. The point is, that it doesn’t make sense everywhere, so you have to do the sums. It also shows that there are still plenty of places where the premium to ‘buy in’ is high. You’ll see the same thing in much of Clontarf or Malahide which are considered good neighbourhoods in North Dublin. Going around the country the picture is different, in rural areas there are few and far between examples where it makes sense to buy rather than rent, so for now it is very much a story of cities. In Douglas or Balinlough in Cork city, a nice rental property is about €1,000 and upwards per month. To buy the same type of property in the region of €280,000 shows again, that renting is cheaper. This proves the ‘premium’ that exists in those areas. When you start looking at normal 3 bed stock though you get the same story as we did before, it is cheaper to buy than rent. Try the calculation for yourself and post the results. You will probably start to see a similar picture. this all sounds great but there is still the part of saving up your 10-20 k deposit and pay other rent and bills at the same time.the Goverment should bring out a new first time buyer scheme for people in full time jobs and that can prove they can afford to pay a mortage each month with some sort of saving behind them to but again its just raising that big deposit. If you have the deposit saved, are lucky enough to be in a good, steady job and you can find a bank willing to give you a mortgage, then go for it. However, for those Renting who never got a chance to get on the property ladder, it doesn’t matter if there are bargains out there it’s virtually impossible to save a deposit when you’re forking out rent. Surely the banks should take into consideration that the majority of people are renting now and if they haven’t defaulted on their rent for x number of years, then surely they should be given a mortgage based on this? Rent to Buy is something that should have taken off like a rocket but for some reason never did? I think the time is right now for it to come into place. It’s a win win scenario. Landlords who ultimately want to sell their homes could already have their buyers living in their property. If a Landlord and Tenant come to some agreement along these lines, then Banks should be open to this when people are applying for a mortgage. All properties should be attainable to people now and in the future and any selling method should be considered, especially those who have had no choice but to rent shouldn’t be left behind again! @Confused The calculator does two things, it calculates rent or mortgage repayments depending on the route taken, as well as ‘capital owing’ at the end. That is why different property prices will give different answers even to the ‘rent for 10yrs’ because the premise is that you are going to buy now, in 5yrs or in 10yrs. If you want to rent forever you don’t need this calculator. The pure rental figure doesn’t change, it’s the first number in the last row each time. Hope that helps! Well said Aidan. Property tax could be anything. The EU dictates our tax policy now and they have recently released a plan for growth that includes cutting labour taxes and replacing them with property and consumption taxes. Will we have a French style property tax that would work out at about 1500 a year or a Swiss style one based on notional rental value of the property. It’s a wildcard and anyone thinking of stepping into a stagnant/falling market with the propect of rising interest rates should bare this in mind too. Why does the amount calculated for my rent differ when I change the value of the house I intend to buy even though my rent is a constant. Can understand the cost of buying changing but not my rent!!! I’m always fascinated by the diametric opinions, on one hand there are the ‘don’t buy a house ever’ side, on the other the ‘buy right now’ cohort. I’d be of the opinion that people should do what makes sense for them, but what is that? 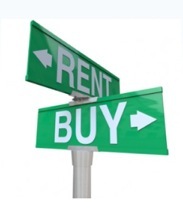 Obviously, for some who prefer renting that is a pre-set bias, the same for buyers. Question is, did you do the figures before making that decision? You could hold off for the market to drop even further but what’s the point, who knows where the bottom of the market is, now is a good time to buy as there are great deals to be had out there, so I would say to anyone who has a deposit, and a good job, stop talking about it and go and do it, you can’t rent for the rest of your life. The problem is that when you buy a property your locked into a situation in a totally stagnant market with 2 huge elephants about to be let loose namely Property tax and the shredding of Rent allowance in the next few years which will bring down rents. Also anyone buying should, for there own financial well being buy with the mindset of a landlord ( rental yield ), if a persons circumstances change and with 4 horrendous budgets on the way there will be changes. The only way open to people to move on with there lives will be to rent out said property,. Now is not a time for any head in the cloud decisions. We have seen where they lead and the misery caused. All very well suggesting to buy but and it’s a big BUT, our friendly state banks will not lend to a couple earning e.g. 80K between then for this type of property. You need to have too much in the bank and have a no risk high salary to get any sort of support to buy. The second but has already been referred to.. property prices are still falling and will do so imho until the end of next year. Maybe then the lending criteria will have relaxed a little. I would love to buy – but I am in negative equity. I assume you’ve heard of that? I bought a very small house in 2003; I’ve been told by a local real estate agent that it is about 50,000 under water currently. It’s not in a great area, and I would love to sell it and buy another property. But I can’t. So I am renting it out, renting elsewhere, losing money in the process, and just hoping that I can manage financially until I finally limp back towards having some equity – oh, and until there is actually a prospect of having some buyers in the market. I know your item is aimed at 1st-time buyers, but I assume they also have huge barriers in their way, such as getting mortgage finance. If they didn’t, I might stand a chance of selling my house some time before I get too old to take out another mortgage. In your choice of property’s you picked Dublin 3 which includes Clontarf, These properties could have risen lately. Can you provide the increase in property prices for Marino and then we can make a more accurate comparison.I fear that prices are still falling and therefore buying now is not good advice.